Not strictly an agate, but colorless or white-gray chalcedony with tree or fern-like dendrites. 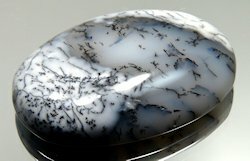 Dendritic agate is not enhanced. 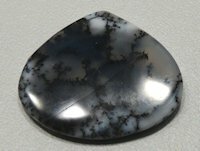 Dendritic Agate is a member of the Agate gemstone family. With white and grey areas. With areas of darker orange. With white and gray areas.